★ Ganga Manthan was organized on 7th of July, 2014 at Vigyan Bhawan, New Delhi. It was a national level consultation to facilitate interaction with various stakeholders including policy makers and implementers, academicians, environmentalists, saints and spiritual leaders from all faiths and NGOs for the cause of Ganga Rejuvenation. The event began with an Inaugural session with addresses by Sushri Uma Bharati, Hon’ble Minister of Water Resources, River Development & Ganga Rejuvenation; Shri Nitin Gadkari, Hon’ble Minister of Shipping, Road Transport and Highways, Rural development, Drinking water supply & sanitation; and, Shri Shripad Naik, Hon’ble Minister of Tourism and Culture. Inaugural session was followed by sanits session where spiritual leaders of different religious beliefs came together on one platform to guide and share the viewpoints on the challenges and solutions for rejuvenation of river Ganga. After this session there were four parallel sessions for which the participants were divided into 4 groups: . 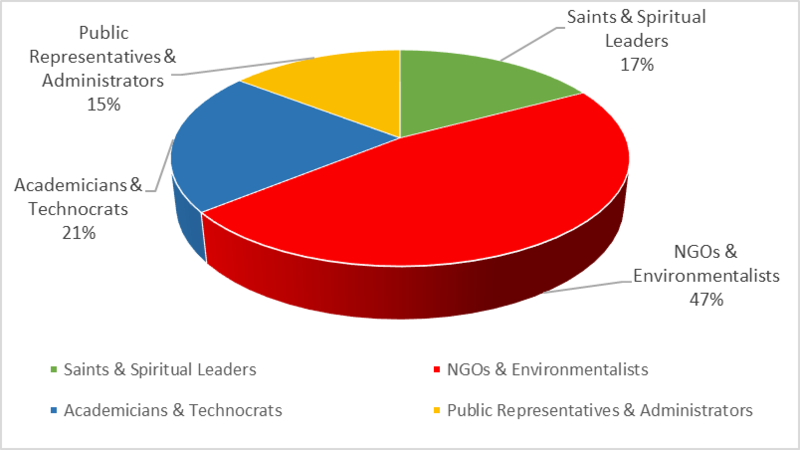 ★ The total number of participants in this event is approximately 500 with group wise representation given in the pie chart: During the group discussions, problems related to river Ganga were discussed and recommendations were provided by 4 streams of the society (represented by the groups) to restore the river Ganga. All the participants derived at a common consensus that River Ganga should be ‘nirmal’ and ‘aviral’. The suggestions by the participants will be considered while formulating a comprehensive strategy for Ganga conservation. Address by ministers showed the commitment of the government to undertake this task. Ganga Manthan marked the beginning of people movement where people from different spheres came on one platform to discuss their concerns and provide the recommendations to bring river Ganga to its original glory. .